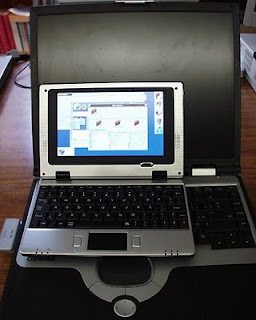 The Letux 400 has a wide-VGA screen, 800x480 pixels. Bright, crisp and well readable, but sure an uncommon format. 800x600 was common for laptops for a long time. How do standard desktop applications fare on the Netbook? Some just don't fit, but there are several which just work and allow to have a small workspace available. The first screenshot shows that albeit crammed, the Workspace is fine. The panel with the folders could be closed to gain even more space. Behind you can see the Terminal application. Sure, only one can be seen at a time, but it is enough to work. Then we have the AddressManager showing up in all its glory. Fits tight but fits. A really useful application on a Netbook! The last image shows the Vespucci browser on the Letux. Works fine. Note: Screenshots are from applications actually running on the Letux 400, not mock-ups. 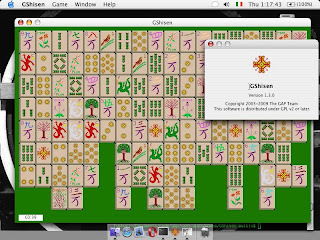 Well, after having ported to GShisen to Macintosh I had absolutely get it running on Windows. This requried some minor changs in the code since mingw is not a complete POSIX system. However, as the screenshot testifies, GNUstep proves once again its portability power. The screenshot also shows the horizontal in-window style menus. So, after the work of clean-up of GShisen its interface is now created mostly from its Gorm file, including its menu structure and dialog panels. The nice thing is that mostly it was code removal! Everything is not smoother and clearer. Now, with a clean project I attempted a port to Mac, I redid the whole project in Xcode and the NIB file in InterfaceBuilder, within two hours I had a usable GShien on the Macintosh. A port already existed, but the new NIB-based interface is much smoother and indeed perfectly native. Really amazing at how fast the port is and how ProjectCenter-XCode and Gorm-IB relate side by side. I actually like how clean the GNUstep counterparts are. Setting up the InfoPanel on ProjectCenter is a breeze and it comes out perfect! 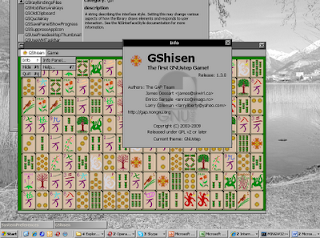 There is an application - half forgotten - that claims to be the first GNUstep game: GShisen. It is part of of the large number of programs Enrico Sersale worked on. The application has its roots 9 years ago and its code, and project is old, although it still works fine. I intend to make GShisen part of the GNUstep Application Project: development in GNUstep has taken long strides and I want to update GShisen for it: a modern ProjectCenter project and not hand coded files, GORM files for windows but also menus, which were hand coded in main.m! As well as standard ways to show Infopanels, dialogs, etc. Things are so convenient now. The advantage is also that the code size gets smaller! For the first release, I do not intend to add any new features, the user won't notice the difference. GNUstep is addictive, so one has to have it always handy... laptops, virtual machines, Windows port are means, but netbooks? The current trend? The smallest one I found around is the Letux 400. This small nifty thing is light (670g, about 2/3 of the typical Atom netbook) and really small, as an A5 piece of paper. Small enough that the thumbs can reach the touchpad. The display is small, but extremely bright and very crisp. It is perfectly viewable even outside with sunlight, really amazing. Both WiFi as standard LAN networking are present. The nice touch is the MIPS CPU instead of an x86, which, as a seasoned SGI machine user, stirred up my interest. The CPU, of embedded fame, is just passively cooled (which, since the 2GB flash constitutes the solid-state drive, makes it absolutely silent) and consumes little power, I reached more than the stated 4h of operation, getting almost 5h sometimes. The machine comes with a 2.4 series kernel and a custom distribution, which I won't discuss here. Golden Delicious computer, the distributor, sets up a second partition where Debian comes preinstalled and with a script (easy to customize) it is possible to work with chroot in Debian. This is a good setup for the current phases of development, convenient as it uses the standard mipsel distribution. With the current version of GNUstep, it is possible to install easily the core system and, thanks to the GNUstep Application Project, one can get a small and functional GNUstep environment. The Workspace Manager GWorkspace runs fine as well as Terminal. Of course I also tried SimpleWebKit and Vespucci on the Letux and, as expected, they work fine and run! It is the foray to a small, portable browser. The future is bright! Apart from standard GNUstep development, a better kernel (2.6, which is in the work) able to solve some of the glitches present in the SkyTone supplied one, as well as a more optimized Linux distribution instead of the chrooted Debian could provide a really interesting ultra-mobile solution for GNUstep.